The cost and kinds of hunting and fishing license in Alabama changed significantly beginning September 1, 2007 due to the passage of The Wildlife Heritage Act of 2007 (click here to view summary sheet). To qualify for a resident hunting or fishing license, a person must be a bona fide resident of Alabama for a minimum of 90 days continuously immediately prior to purchasing any such license. Resident and nonresident annual hunting licenses are valid from September 1 through August 31. Successfully completing an approved hunter education course is mandatory for all hunting license buyers born on or after August 1, 1977. Licenses must be in possession while hunting or fishing. In addition to our office, Alabama hunting and fishing licenses are available in all sections of the state from approximately 950 special agents in many sporting good stores, marinas and other courthouse offices. A person without an Alabama driver's license must present proof of residency to the local licensing office at the courthouse to purchase hunting or fishing license. To view Residency Requirement Flyer (click here) . 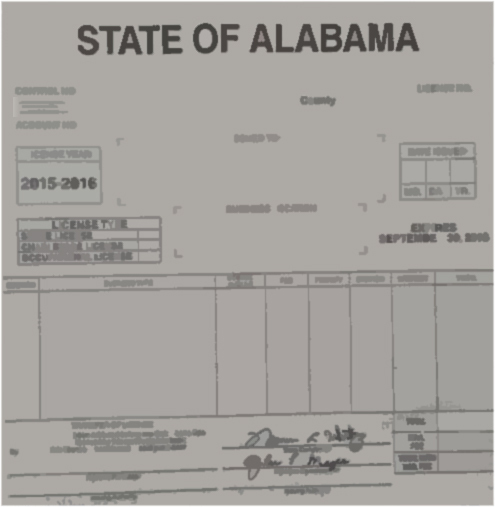 Nonresident licenses may also be purchased by mail from the Wildlife & Freshwater Fisheries Division of the Alabama Department of Conservation and Natural Resources (64 N Union St. Ste 567, Montgomery, AL 36130). Licenses are also available by calling the toll free number: 1-888-848-6887 or online (click here). Residents 65 years of age and over are exempt from buying hunting and fishing licenses, wildlife management area license or state duck stamp, provided that qualified resident has on his person while hunting or fishing a driver's license or proof of permanent Alabama residence and age. Hunting license are required for residents 16 years of age and under 65 years of age and nonresidents 16 years of age and older. To view Military Requirements (click here). State and Federal duck stamps are required when hunting migratory waterfowl. All licensed hunters who hunt doves, woodcock, rails, snipe, coots, ducks or geese in Alabama are required by federal law to obtain a Harvest Information Program (HIP) permit prior to hunting. The permit is free and available at all license agents. For a listing of current hunting license fees (click here). Fishing licenses are required for residents 16 years of age and under 65 years of age who fish with rod and reel or artificial bait in public waters. A nonresident license is required for fishing in any Alabama public waters regardless of tackle used. Also, special license fees apply to residents of Florida, Louisiana, Mississippi and Tennessee due to reciprocal license costs. For a listing of current freshwater fishing license fees click here. For additional information regarding hunting or fishing laws or regulations, you may wish to contact the District Wildlife & Freshwater Fisheries Office for Houston County at 334-242-3465.